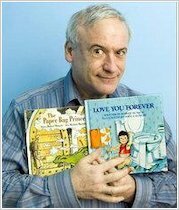 Robert Munsch took a circuitous route to writing children’s books: he spent seven years training as a Jesuit priest, then worked in an orphanage till settling into being a child day care worker. It was in this final job that he discovered a gift for storytelling – but it still took a few years to write his first official book. Since then, Robert has never looked back and is most famous for books like The Paper Bag Princess. He was born in the USA and now lives in Canada. Robert Munsch was the American Booksellers’ Author of the Year in 1991 and received a star on Canada’s Walk of Fame in 2009!